"This is not your ordinary roast, but a flavorful surprise. Simple enough to put together with ease, but interesting enough to serve to dinner guests on special occasions. Feel free to add your own special touches. Adding sun dried tomatoes and bell peppers works wonderfully. Delicious served over steamed white or Mexican style rice." Heat the oil in a skillet over medium heat, and brown the roast on all sides. Season with salt and pepper, and transfer to a slow cooker. 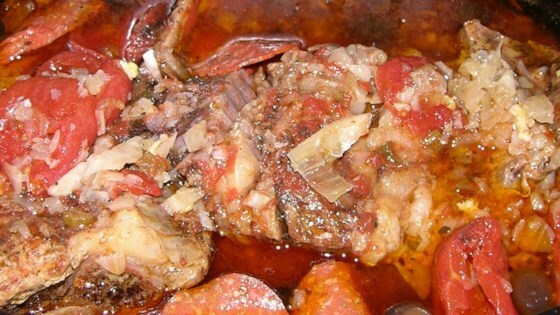 Dissolve the vegetable bouillon in the boiling water, and pour into the slow cooker. Mix the pepperoni, onion, black olives, garlic, and tomatoes into the slow cooker. Cover, and cook 4 hours on High or 8 hours on Low. YUM! I added some shredded mozzarella and Italian herbs and called it Pizza Pasta. Love it. this was awsome and easy to make. I have made this dish twice now and it is absolutely wonderful! Love, love, love it!